Celebrating accomplishments, however small, is an important skill in recovery, and life. This is not something I really understood, as a perfectionist, until more recently when working with clients. When I was in my undergraduate program, I minored in leadership. I kind-of fell into the leadership minor, which wouldn’t have been my first choice as I didn’t see a definable outcome or skill-set, but here I was. Throughout my life, I have been a goal-setter and achiever. Each year for as long as I can remember I write out my big goals for the year on a pretty piece of paper, and post it in my room so I see it every day. I have always achieved at least 80% of them by year’s end. I hadn’t really thought about how I achieved these goals – I just knew they were important, and took steps to make them happen. Throughout the year though, I struggled along. It is not often a linear path to achieving goals, as I’m sure you know. Whether it is recovering from an eating disorder or meeting an income goal or being able to execute a dance move, goals take work. Being in the leadership minor we had a class that spent a lot of time on celebrating accomplishments as they happened – not just year-end/big project goals, but little things. It was a form of team leadership, but we also had to apply it personally. This was really hard for me at 20 years old. It is really easy to celebrate a major win. 100 days binge-purge free. Graduating. Getting the lead in a play. These are major accomplishments. 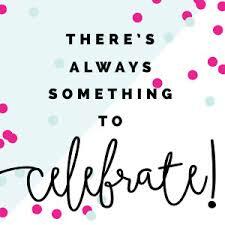 But when we are stuck in the minutia of daily life it is even more important to celebrate the small accomplishments. 1 day behavior free. Finished writing a paper. Made it through an audition without crying. A week without suicidal thoughts. Able to go to a grocery store and actually purchase food in a reasonable amount of time. These little details are progress! Essential progress towards your larger goal. The importance of these were really shown to me, as I counsel my clients through recovery. I feel so privileged to get to see the big-picture of their growth over the weeks and months while they are stuck in the struggle of the day-to-day. Recently, I was in a session with a client, and she was really struggling to see the “light at the end of the tunnel.” She felt like she had been stuck in the eating disorder for so long. My heart hurt for her. She couldn’t see the amazing work she had been doing over the past year we had been together. By taking a birds-eye-view of her progress, she was able to see that not only was she no longer suicidal (a huge improvement in itself! ), she had been able to eat a much larger variety of foods (even though there are still some fear foods), her blood work had improved, and she was more social and had friends that would have terrified her a year ago. She is not fully recovered. I now ask most of my clients to keep an accomplishment log from week-to-week. It can be the smallest things like they ate a certain food, or big things like they went to a social event that was scary. They don’t have to show me, or anyone else, their log if they don’t want to. The more we can own our accomplishments the more trust we have in our self to keep going, keep accomplishing, and build the skills we need to reach bigger goals. I want you to take action: Start writing down your successes each day or week. It may feel stupid at the time, but when you look back months or years from now you will see how far you have come, and feel more capable to make change in the future. Libby Parker, MS, RD, lives in California, where she has a private practice as a Registered Dietitian, dispelling fad diet myths and helping people recover from eating disorders. Libby specializes in college student eating disorder recovery, both in-person and virtually. When she is not kicking “ED” to the curb, Libby is on-stage dancing and performing in musical theatre. You can find her at NotYourAverageNutritionist.com - Be sure to check out her YouTube channel for weekly, quick, educational videos, and find her on social media @DietitianLibby.